A week of despair – a day of hope! It certainly was one of those weeks… and I am not referring to the school return, I am referring to THAT picture. At first glance… another family photo on my timeline? A closer look… a feeling of unease. Realisation hit and a feeling of disbelief. I love that age… walking, talking, infuriating, opinionated and a bundle of love and fun. Life is for living when you are three… and I can only imagine that is what Aylan’s parents thought as they put his life, and the lives of his whole family at risk, boarding that boat and grasping the small hope that, at the other end, lay a chance at life – at real living. As a parent, how desperate do you have to be to take that chance? I have spent the week asking myself that but, to be honest, I can only follow the thought so far… there are some things you never want to think about. Then there was another image, that of Aylan’s dad, outside the morgue, collapsed against the wall. He began his week with a glimmer of hope, he finished it with utter despair. My son spotted the photo of Aylan in a newspaper earlier in the week, as we stood in a shop queue. I watched his expression… bewildered and questioning. He looked away, then, like many of us… he looked back. He looked up at me and as I waited for his question my brain was scrambling for the correct response. How could I explain this atrocity to my son when I still couldn’t understand it myself? In the end he looked away … never working out what question to ask, and I understood how he felt. Yesterday there was a new image… I watched the scenes unfold in Munich as the first Syrians arrived. They first appeared a little shocked, who could blame them. But then smiles started to spread across their faces, finally reaching from ear to ear. How long had it been since they smiled a full smile? I am guessing they felt hope too, because that is what I felt as I watched. And I saw a small boy, like Aylan, in his father’s arms, with a face full of delight. I know that the image of little Aylan, and his story, will stay with me forever. I hope the image of that small boy in Munich will stay with me too. Now I finally feel ready to tell my son all about the boy in the photo. We will talk about the events and lives of families, just like ours, and we will decide together how we can help. Go to Uplift.ie to sign the petition urging the Irish Government to do more to help. You can also find links to donate money from here, or even pledge a bed! For anyone in the UK you can sign a similar petition here. There are numerous charities helping the refugees crossing the Mediterranean sea. Some of these include Medecine Sans Frontieres, Amnesty International, or Trocaire. You can join a virtual coffee morning – organised by the Irish Parenting Bloggers. Just click the link to find out all about it. You can spread the word in any way you can think of, join the blog hop mentioned below, if that is your thing or used social media ( we are using #ReadFeelAct) or word of mouth to tell anyone and everyone how they can help. 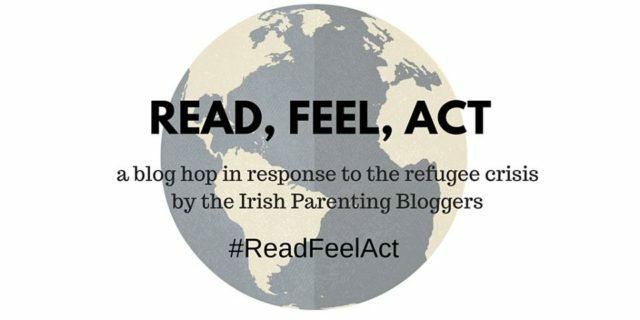 This post is part of a “blog hop” organised by the Irish Parenting Bloggers Group, in response to the current crisis and in an attempt to raise awareness and provide a few ideas and links for people who might want to help. You can read what others have posted by clicking on the posts below.